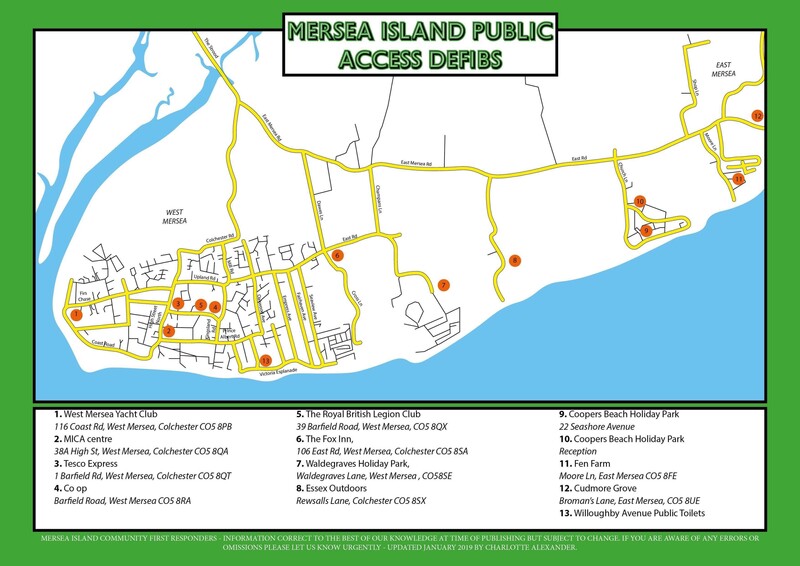 Please click_here to view a list of defibrillators on Mersea Island and click_here to view the map of defibrillators. If you wish to join the Mersea Island Community First Responders please telephone 07974 661829. Barfield Road, West Mersea - West Mersea Firemen are a part time force under the control of Essex County Council. Mersea Fire Brigade began in a shed on the corner of Melrose Road - it was manned by 12 part time volunteers. The first Fire Engine was a hand cart and firemen were summoned by one of them cycling round the island blowing a bugle. In 1935 they fund-raised and purchased their first proper Fire Engine - a Dennis - and new Headquarters were built in Melrose Road (now the Scout HQ). In 1973 the Fire Station moved to Barfield Road, when the 999 system and personal pagers came into use. RNLI - The Mersea Lifeboat is manned by local volunteers. The first Lifeboat Station was built next to the Yacht Club on the corner of Firs Chase in 1963, when a D class Lifeboat was put into service - one of the first ten lifeboats established in the country. In 1971 the D class was replaced with an Atlantic 21 Lifeboat. In October 2014 the new lifeboat B-879 "Just George" arrived. Contact: Lifeboat Operations Manager, West Mersea Lifeboat Station, Coast Road, West Mersea, CO5 8PG. Police non emergency - Tel: 101 or click on the website link to report on-line - For reporting non emergency crime and incidents, road traffic accidents, lost and found property, fraud, hate crimes, abandoned cars, speeding jet skis and boats etc. If a jet ski or boat is causing concern for health and safety call 999. Anonymous crime reporting line, similar to Crimestoppers but aimed at children, youths and young adults. Colchester Borough Council and Essex Police have joined forces to provide you with a direct line to report anti-social behaviour. You can now speak to a team of dedicated specialists who can talk through your problems and if necessary, deal with your call more efficiently by assigning it to the correct agency. The ASB hotline number is 01206 282731, it will operate between 8.30am and 5.30pm, Monday to Friday. Callers outside these times should leave a message - but urgent calls (i.e threat to life) should ring 999. Beach Hut Watch organises patrols of member's beach huts in West Mersea reporting damage to owners and the Police. They liaise with local Police on crime prevention and with local councils and other parties to maintain and enhance beach amenities and the environment. If you discover damage to any of the beach huts please telephone Colchester Borough Council on 01206 282911. Any information connected with offences against beach huts should be forwarded to Colchester Police Station - Tel: 01206 762212.